Join us for the 2019 RIC Conference keynote address by Bernard Harcourt on Friday, April 5 from 6:15-8 p.m. in Olin 305. Bernard E. Harcourt is the Isidor and Seville Sulzbacher Professor of Law, Professor of Political Science, Executive Director of the Eric H. Holder Initiative for Civil and Political Rights, and Founding Director of the Columbia Center for Contemporary Critical Thought at Columbia University. His scholarship intersects social and political theory, the sociology of punishment, and penal law and procedure. 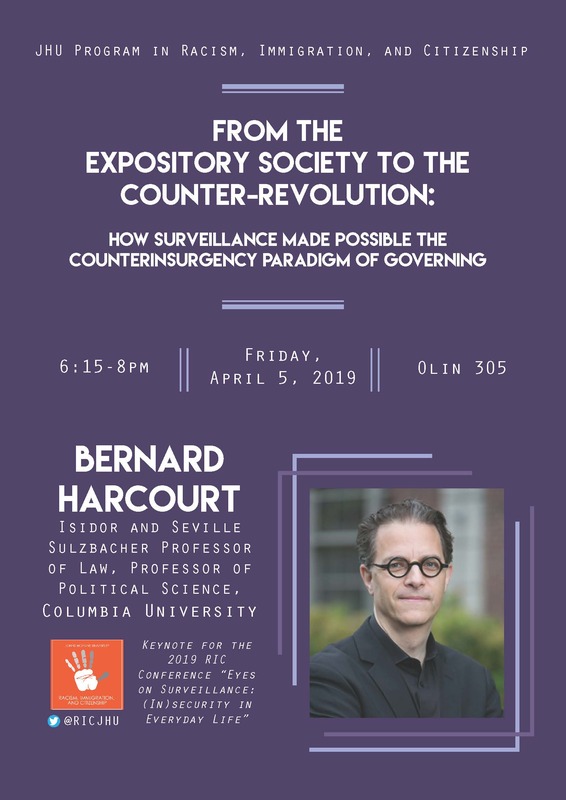 The title of his talk is: From the Expository Society to the Counterrevolution: How Surveillance Made Possible the Counterinsurgency Paradigm of Governing.